Source: M.C. Escher in FastFrame - The Online Art Store I don't just come to a halt, I am still going, but I have run out of space to move in ... You see, my space, our space, is nothing like your space: our space gets bigger and smaller, it bounces back on itself, and it loops itself round till it runs into itself. In a global world we want to learn from other cultures, and so we need to open up to these, even if our own culture tells us that it is not us but the other culture that needs to learn. In general, peculiarities and limitations inherent in our culture are invisible to us whereas they are quite obvious to members of other cultures. But once in a while we undergo changes that enable us to see beyond our horizon. Obviously, one such change would be living and working many years in a different cultural environment. Another would be the onset of or the recovery from an illness. Many people with Parkinson's disease switch back and forth between the diseased and the normal state. Oliver Sacks has interviewed a number of them, and what they tell us reminds us strikingly of similar albeit weaker processes within us. Thus, their reports provide profound insight into the structure of our mind. I will start with bounds everyone of us has if s/he has not learnt Einstein's Special Theory of Relativity - my lack of intuitively understanding that my one hour is not your one hour when you move and I don't. Interestingly, Parkinson disease distorts space and time, too, only that this distortion has a neurological basis. Parkinsonian patients let us know that sometimes they are entirely without time. Time has stopped dead for them. Sometimes they lack "will", meaning that they do not know what "willing" means. At other times they have too much will, in the sense that their will is precisely matched by a counter-will, rendering them immobile, both physically and mentally. 20th century physics has brought us the breakdown of a priori knowledge, such as our notion of time. Einstein's Special Theory of Relativity (and its experimental verifications) has demonstrated us that persons in a moving train live in a different time from our's on the station platform. The people in the train age less than we do - and we age less than they do as seen from their train. We all live in our local time, and we have to modify our a priori intuitive notion of time according to the models of physics (p. 128 in A. Pais, "Subtle is the Lord - The Science and Life of Albert Einstein", Oxford University Press, 1982). An intuitive notion has its roots in the structure of our consciousness, our "maps" of the world, so tells us Gerald Edelman in "Bright Air, Brilliant Fire". Parkinson's Disease has resemblance to a neurosis and it can even be transient. Many Parkinsonian patients temporarily leave their world, returning for some time to our world. So, Parkinsonism might be called a "state" deviating from our "normal" state, rather than an illness. Our body apparently has the ability to switch between a Parkinsonian and a normal state. That suggests perhaps close and revealing relationships between our "normal" consciousness and the Parkinsonian consciousness. A large number of Parkinsonian persons have been interviewed by Oliver Sacks while in their normal state ("Awakenings"). He lets us know that Parkinson patients have their own time and space. His (or rather their) reports point out amazingly close parallels between e.g. our false intuitive non-relativistic notion of space and time and their Parkinsonian notion, in the sense that both notions are entirely convincing to the owner and totally exclusive of other notions. In other words: If we are absolutely sure of something, we might be the victim of a neurological deficiency, perhaps in the form of an exclusiveness of our maps in the above mentioned sense. Another striking similarity between the "normal" and the Parkinsonian state can be seen in some roots of inactivity. "There are many different forms of akinesia, but the form which is exactly antithetical to hurry or pulsion is one of active retardation or resistance which impedes movement, speech, and even thought, and may arrest it completely. Patients so affected find that as soon as they 'will' or intend or attempt a movement, a 'counter-will' or 'resistance' rises up to meet them. They find themselves embattled, and even immobilized, in a form of physiological conflict - force against counter-force, will against counter-will, command against countermand. For such embattled patients, Charcot writes: 'There is no truce'- and Charcot sees the tremor, rigidity, and akinesia of such patients as the final, futile outcome of such states of inner struggle, and the tension and tiredness of which Parkinsonian patients so often complain as due to the pre-emption of their energies in such senseless inner battles. It is these states of push and constraint which one patient of mine (Leonard L.) would always call 'the goad and halter'. The appearance of passivity or inertia is deceiving: an obstructive akinesia of this sort is in no sense an idle or restful state, but (to paraphrase de Quincey) '... no product of inertia, but ... resulting from mighty and equal antagonisms, infinite activities, infinite repose'. when the former holds sway, the performance of normal actions is rendered difficult or impossible; if the latter is dominant, abnormal actions are irrepressible. Although James uses these terms with reference to neurotic perversions of the will, they are equally applicable to what we must term Parkinsonian perversions of the will: Parkinsonism, like neurosis, is a conative disorder, and exhibits a formal analogy of conative structure." Other aspects of such 'negative' disorder or deficiency in Parkinsonian patients relate to feelings of tiredness and lack of energy, and of certain 'dullness' - an impoverishment of feeling, libido, motive, and attention. To a greater or less degree, all Parkinsonian patients show alteration of 'go', impetus, initiative, vitality, etc., closely akin to what may be experienced by patients in the throes of depression. Thus Parkinsonian patients suffer simultaneously (though in varying proportions) from a pathological absence and a pathological presence. the latter constitutes a preoccupation, an abnormal activity, a pathological organization, which, so to speak, distends or inflates their behaviour in a senseless, distressing, and disabling fashion. Patients can be thought of as engorged with Parkinsonism - with pathological excitement ('erethism') - as one may be engorged with pain or pleasure or rage or neurosis. The notion of Parkinsonism as exerting a pressure on the patient seems to be supported, above all, by the phenomenon of kinesia paradoxa which consists of a sudden and total (though transient) disappearance or deflation of Parkinsonism - a phenomenon seen most frequently and most dramatically in the most intensely Parkinsonian patients. Thus one may see such patients, rigid, motionless, seemingly lifeless as statutes, abruptly called into normal life and action by some sudden exigency which catches their attention (in one famous case, a drowning man was saved by a Parkinsonian patient who leapt from his wheelchair into the breakers). The return of Parkinsonism, in circumstances like these, is often as sudden and dramatic as its vanishing: the suddenly 'normal' and awakened patient, once the call-to-action is past, may fall back like a dummy into the arms of his attendants. Penny Marshall uses Rilke's poem "The Panther" in her film "Awakenings", to express some of this. with tiredness, it can take in nothing more. and no more world beyond them than before. some mighty will stands paralyticly. and end its being in the heart. M.C. 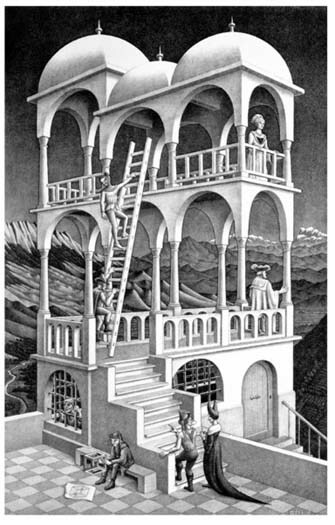 Escher showed us vexing examples of our visual limitations. His pictures become disturbing when one realizes that on a neurological level our visual perception is probably one part of our general perception, of our becoming conscious. Thus in his recent essay "In the River of Consciousness" Oliver Sacks uses vision as an extremely illustrating example and sometimes synonym of consciousness. Parkinsonian patients, he says, "described extraordinary 'standstills', sometimes hours long, in which not only visual flow was arrested, but the stream of movement, of action, of thought itself. ... Such standstills showed that consciousness could be brought to a halt, stopped dead, for substantial periods, while automatic, nonconscious function - maintenance of posture or breathing, for example - continued as before. " "Vision, in ordinary circumstances, is seamless and gives no indication of the underlying processes on which it depends. It has to be decomposed, experimentally or in neurological disorders, to show the elements that compose it. Thus it is decomposed vision -the flickering, perseverative, time-blurred images experienced in certain intoxications or severe migraines- which above all lends credence to the notion that consciousness is composed of discrete moments." "moments are of an essentially personal kind, which seem to constitute our very being. ... We consist entirely of 'a collection of moments', even though these flow into one another like Borges's river." "Time", says Jorge Luis Borges, "is the substance I am made of. Time is a river that carries me away, but I am the river...."
"Our movements, our actions, are extended in time, as are our perceptions, our thoughts, the contents of consciousness. We live in time, we organize time, we are time creatures through and through." Modern neurology might give us a description of how utterly invisible to us are the bounds of our own consciousness with its imperceptible "standstills", absence of will or canceling out of will and counter-will. It may offer a working hypothesis for the resulting limited plasticity of our mind. The hypothesis might help us let go of impeding preconceptions. The hypothesis might point out means that are available to us e.g. in the arts, that can liberate us from "standstills" or "freezes" of our consciousness. We feel a great joy when liberated, released from a cultural cage, as we know from hearing music, seeing plays or films, sculptures or architecture. It is the same joy that makes us curious and try new things out or play basket ball with others. Children spend hours with books, simulation games or their musical instruments. Computer hardware and software is increasingly becoming available that introduces us to hitherto unknown areas of human activities. This might include the new legalistic systems as diverse as Greenpeace, the World Trade Organization or Amnesty International. Apart from providing us the above mentioned fun these simulations might help break down cultural barrieres that hinder our present cross-cultural exchange and thus liberate us from our culturally specific standstills.